During the holiday season, the Cedar Falls Historical Society has a few events at the Victorian house on West 3rd Street here in Cedar Falls. The house, dating back to the 1800s, is open for visitations on Tuesdays through Saturdays from 10am until 4pm and on Sundays from 1 p.m. until 4 p.m. The Victorian House is divided into two parts: the first part of the house is the carriage house, which has the exhibits and galleries of the history in Cedar Falls, and the second part of the house is the Victorian house where the families from the elegant era once lived. The Victorian House is the leading house of the Historical Society. The Italianate style house was built in 1863 by a businessman named Azel D. Barnum, who started up a grain, seed and farm implement warehouse on the Cedar River. Barnum lived in the house with his family of four for five years before selling the home to the Bryant family of five in 1874. The Bryant family hosted many elegant gatherings in the family parlor, and Mr. Bryant worked in the lumber industry, which allowed him to stay active within the community. The Bryant family sold the home to Dempster’s in 1947, and afterward, the house was converted into a duplex and then, into smaller apartments. In 1966, The Historical Society purchased the home from the Dempsters and created the old-styled home into a community museum for the public to witness what life was like for a wealthy family in the 1800s during the Victorian era. The home stores everyday household treasures from the 1800s through the 1900s and is open for the public to see first hand what Cedar Falls was like long ago at free admission. The Cedar Falls Historical Society on Dec. 16 is wrapping up their invention exhibit in the Carriage House, which they have been showcasing since February this year. The exhibit includes inventions that were made in Cedar Falls and has a special compartment that shows awards that were won by the CFHS robotics team from the 2015-2016 season. The compartment also includes the robotics team’s winning robot named Cricket. 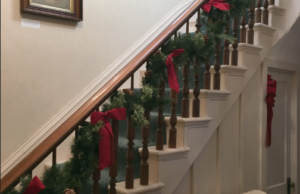 On Nov. 28, the members of the Historical Society decked the Victorian House with Christmas decorations that a family from the Victorian Era would have adorned their house with during that period. The house has an authentic style and looks like a family currently lives in the household. Starting on Dec. 4 this year at the Carriage House, the Historical Society is hosting an event called RE-Inventing the Holidays, a two-part class seminar that lasts from 1 p.m. until 4 p.m., and the admission fee is $20, which includes the supplies needed for the class. The first part of the event is about how to make holidays less stressful for families: make them more meaningful, family-oriented, less expensive, etc. The second part of the event features an artist by the name of Jonna Boman who is teaching a class about how to make glass projects, jewelry, etc. from recycled items. This year the Historical Society will not be participating in the famous Cedar Falls Christmas Walk, which allows the public to walk through the historical sites surrounded by tree lights because of recent changes in the program that began last year. The program now focuses on the current attractions on Main Street including Holiday Hoopla, and it was difficult to coordinate other sites into the program this year. Instead of the Christmas Walk, the Historical Society came up with a new fun way to experience the history within the Victorian house by hosting a Gingerbread Hunt this holiday season. From Nov. 29 through Dec. 23, anyone can come to the Victorian House during office hours and join the adventure of searching for little gingerbread men. Kids can look around the house in search to find the 12 laminated gingerbread men while learning more about the treasures of the magnificent house. Participants receive candy canes for finding gingerbread men while having a blast with friends and family with no charge. After the Gingerbread Hunt is over, the Victorian House will be closed from Dec. 24 through February in preparation for the next year’s events. The Historical Society is partnering with the Cedar Falls Fire Department throughout the month of January in preparation for the celebration of the 150th Anniversary of the Cedar Falls Fire Department. The celebration takes place at the fire station during the month of February, starting on the first Monday in February. The celebration showcases the history of the Fire Department, includes interactions, story time with the firefighters and many more fun activities. Throughout the year, the Historical Society hosts many fun events that help the public have a more clear knowledge of this town’s past. The Historical Society is excited to see new faces come into the sites while being able to stay connected with the entire community. They want to preserve the love of history in the city by broadening their base, which means partnering with more organizations. The University of Northern Iowa has partnered with the Historical Society in the past and have enjoyed reaching out to the community. The Historical Society loves working with their volunteers and is ecstatic to see younger people have interest with being a part of their society. The Society is very interested in historical pieces from Cedar Falls and loves collecting them from the public. The group emphasizes that history is an important part of our society, and it allows people to learn more about their past.